@Nilex posted the news that the new QUAD is now available! Already put my order in! Personally I’m waiting to see what the reviews are and what the comskip possible fee structure is. 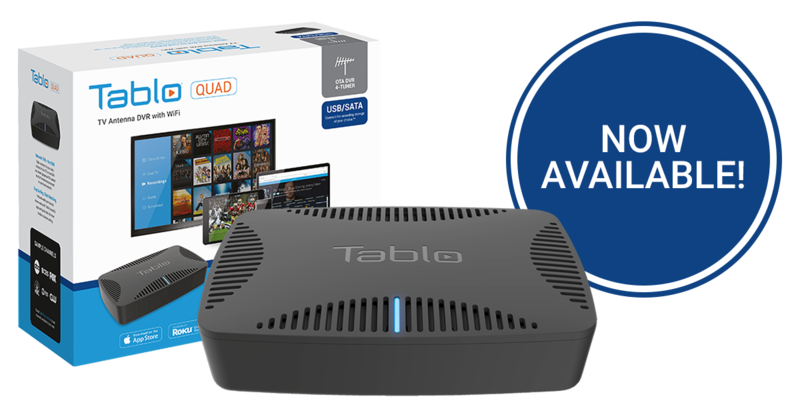 The Tablo Dual 64GB is sold out. The Quad and Quad bundle are both available. The Quad and Quad bundle are both available. 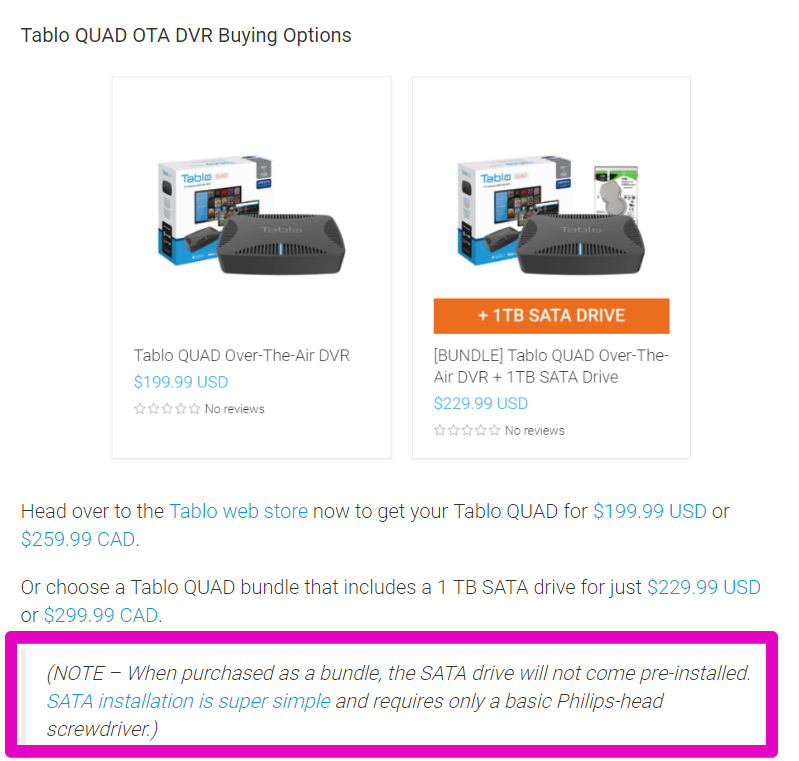 Those who do order the bundle will have to wait a few extra days for shipping while we wait for a shipment of drives. Ordered the bundle. I’ve waited for the Quad, I can certainly wait a few extra days while the drives are in transit. I’m assuming the drives ship loose? As in… not installed? Correct. I read that somewhere. I’ve largely ignored all the marketing about this, having no need for the internal hard drive or upgraded WiFi. But is it known whether there is any improvement to the tuners in this one over the original 4-tuner version? See there? I got so excited I went and ordered before reading the blog post. The product comparison does not list the Ethernet speed of the Quad. Since I do not use WiFi and am not bothered by having to use an external drive (it sits on top of the box), it is not worth the upgrade from my 4 Tuner, even if Ethernet is 1 gig. Does the original 4 tuner not have gigabit ethernet? No, just 10/100. Though that is all it really needs. Purchased. Guess I was going to fast, I didn’t notice the Bundle Version but thats OK I got a 2TB drive. Gotta say, I’m pretty ticked off. No email notification, no text or warning of any kind and everything is already sold out. I’ve been checking almost daily and figured they were just gonna be late. I wonder how long it will be before more are available. It seemed like the old quad was unavailable for months at a time. I found a Seagate Barracuda 3TB ST3000LM024. Now I just need a quad Tablo to test it with. Isn’t that a 15mm drive?